Protecto Wrap AFM Anti-Fracture Membrane, 36" x 75' is designed for use under thin-set tile, stone and marble as a crack suppression and anti fracture membrane. AFM-WM is a 40 mil peel-and-stick crack isolation sheet waterproofing membrane for use beneath thin-set tile and stone applications. Protecto Wrap Flex Deck is a 40 mil thick reinforced peel & stick sheet membrane specifically designed for use in interior applications under thin-set floor tile installations of ceramic, porcelain and natural stone tile as a stress relieving material in conjunction with thin-set methods. 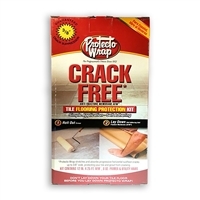 Protecto Wrap AFM, 12in x 25ft is designed for use under thin-set tile, stone and marble as a crack suppression and anti fracture membrane. 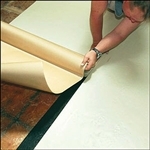 Protecto Wrap Whisper Mat CS, 36" x 40' is designed to be an underlayment for ceramic and stone tile installations where transmitted or impact sound reduction is required. Whisper Mat HW, 36" X 50' roll (150 sqft) is a peel & stick non-permeable sheet membrane, which reduces impact and airborne sound transmissions and is a moisture/vapor barrier for use in Engineered Hardwood, Parquet and Laminate Flooring. P.W. 6000 Primer is a high tack water based primer concentrate for interior applications. AFM 500 Detail Tape is a 40 mil unreinforced conformable tape used for detailing inside corners, drains, posts, protrusions or any difficult-to-conform-to area, prior to installing AFM-WM. 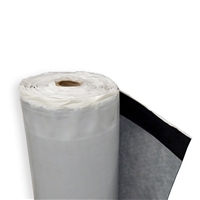 A peel and stick membrane for use as a positive air/vapor stop in everyday construction. Our product is a 40 mil SBS modified rubberized asphalt sheet waterproofing membrane that fully bonds to most substrates through the primer course.